Anyone else remember the days when Survivor Series actually took place on Thanksgiving Eve every year? That’s right, WWE held PPVs on Wednesday night to go along with the holiday, and it really felt like the kickoff to all the festivities every year. 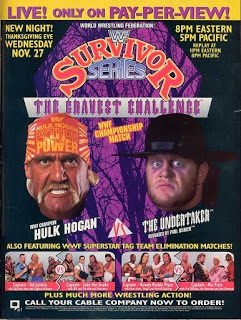 These days of course, Survivor Series falls in line with the rest of the PPVs and takes place on a Sunday, but that doesn’t mean I don’t get the urge to throw a classic Survivor Series event on during the pre-Thanksgiving festivities just like old times – and the WWE Network makes doing so even easier. This year I’m viewing one of my favorite Survivor Series events, even though I’m not sure many old school fans would agree with me. Survivor Series 91 was special for a variety of reasons, one of which was just that the era was an awesome time to be a fan and WWE was stacked with talent. Another reason was the 91 edition was the first ever to have a WWE Championship match on the card. So let’s look back and re-live the Survivor Series 91 magic. Right from the very start of the show, things were definitely different; instead of starting the show with a match like most PPVs at the time, we just right into an altercation that had happened the weekend before – the infamous Jake Roberts attack on Randy Savage that saw an actual Cobra take a bite out of Macho’s arm. The buzz leading into the event was that Savage may replace Sid Justice in the elimination match against Roberts’ team as Justice had been injured the month prior. I was all but sure that Savage would replace Justice and we would see Team Roberts vs. Team Savage; instead we got WWE president Jack Tunney announcing that while Macho Man had indeed been reinstated (he had been retired since earlier in the year at WrestleMania 7 where he lost a career match to The Ultimate Warrior,) he would be facing Roberts 1 on 1 the following Tuesday in Texas. The traditional Survivor Series elimination matches began with what I believed to be the biggest one going into the event; this match featured Ric Flair’s WWE PPV debut as he lead his team against that of Roddy Piper. WWE’s roster was so deep at the time, Flair was able to come in and not only begin a feud with Hogan, but also Piper which lead to many different main event possibilities. It made so much sense back then to see guys like Dibiase teaming up with Flair and their opponents matching up perfectly with who they were feuding with at the time. Pretty creative end here as 6 of the participants are eliminated at once for brawling, which leaves Ric Flair to win the match as the sole survivor. Next up we got a live promo where Mean Gene brought out Macho Man to again hype the “Tuesday in Texas” event. Savage brought out Miss Elizabeth who promised to also be at the event. This match was one of those that seemed a bit thrown together as a few of the participants were strategically placed, while the others just throw in to fill the numbers it seemed. Tito Santana was debuting his “El Matador” character, Slaughter had just turned good again and was teamed with the patriotic Duggan to re-establish his pro-USA ways, and the rest just seemed thrown together. The “bad guys” team even changed quite a few times which is why Hercules who was moving toward the end of his WWE career was in the match. Duggan’s team wins in a clean 4-0 sweep. Back to Mean Gene as he brings out Jake “The Snake” Roberts for more hype, I was really wishing they’d just get it in the ring right then and there and handle this situation since both were in the building! Another shock here as this match happening in the middle of the show which just wasn’t the norm in this era; The WWE Championship in the middle of the show when the other remaining big match on the show had to be jumbled at the last minute? Something had to be up, and indeed it was…..it just wasn’t anything obvious if you were a kid like me at the time. When this match was first announced, I thought it was awesome that we’d get to see a WWE Championship on the show since it had never happened before. As for the match itself, I figured it was a typical run-of-the-mill defense for Hogan. Undertaker had debuted just a year earlier at Survivor Series 90 and to me posed no threat to the title. After all, it was very obvious that we were heading to a Hogan/Flair showdown, so this was just a cool match we hadn’t seen before to give us something special this year. Maybe fans that were older than me saw it coming, but Ric Flair heading to ringside to interfere surprised me, but that was nothing compared to the utter shock of seeing him slide a chair in the ring as The Undertaker hit the tombstone on Hogan for the 1…….2……..3. A NEW WWE Champion had been crowned and it was a guy that had barely been in WWE a year, and one that didn’t even have much of a long-term issue with Hogan. It was out of the blue, it was shocking……….it was the set up for yet another “Tuesday in Texas” controversy. Regardless, I had seen Hogan pinned exactly TWO times in the 6 years prior to this, so seeing it happen again and to such a surprising opponent added to the “absolutely anything can happen” vibe in wrestling at the time. While the Undertaker was indeed the new champion and Hogan had to be helped from the ring, before the show was over we already had a rematch booked for Tuesday in Texas due to the controversial interference from Flair. Next we move to some classic backstage style interviews with Mean Gene and Sean Mooney as they interview everyone from Roddy Piper and the teams involved in the final match of the night to Ric Flair and Jack Tunney himself who announces the Hogan/Undertaker rematch. If you’re looking at the historical perspective, this WWE Title situation is what eventually lead to the Royal Rumble in 1992 being for the title and Flair becoming champion. The obligatory “team team” Survivor Series match was cooler when it actually had 5 teams on each side and you had 20 guys around the ring; none the less the 91 version was really built to further the Rockers break up saga that would be completed the following month as “HBK” would be born and of course go on to his hall of fame singles career. The Nasty Boys and Blake Beverly survive 3-0 in this one. Quite an odd main event as this match had been downsized to 3 on 3 being Sid was injured and Roberts was taken out of the match. Still, with all the action this show provided, seeing the crowd roar as the “LOD” hit the ring was no loss and a fine ending to this roller coaster of a show. LOD stands tall to end the live show as Boss Man is eliminated, but comes back to make sure IRS gets his due after The Natural Disasters walked out on him. The final segment of the show saw Mean Gene finally “locating” The Undertaker in the “bowels of the building” for one last Tuesday in Texas promo. While some fans may have hated the obvious push for Tuesday in Texas on this show, as a kid I thought it was awesome to get an extra PPV and to have all this drama going on. A new world champ, new feuds popping up, and a bit of uncertainty as to where it was all going. Survivor Series 91 is one of my favorites, and overall a fun period in WWE!